Honestly, What Are The Odds?! This was one California Proposition I hoped had passed yesterday in the election. 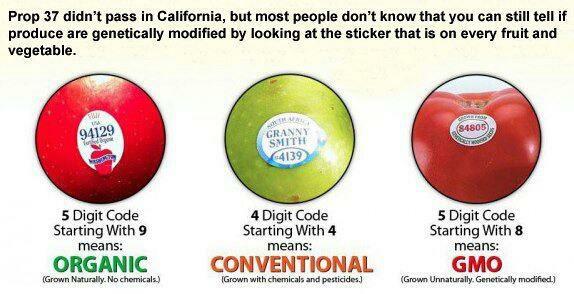 WE HAVE THE RIGHT TO KNOW what’s in our food. Read this awesome article to find out more. At every election, California‘s ballot is filled with initiatives, but none received more attention this year than Proposition 37. I’m very scared of what we are doing to ourselves by blindly accepting what is in the food we purchase. The rise in so many health concerns, and issues is based on something. I highly suspect it is mostly based in our food consumption. COMPLETELY AGREE! Well the large corporations in charge of the GM foods on our tables raised $45 Million in the Vote No campaign for Prop 37 – while small consumer groups in the organic food industry raised around $6.7 Million in the Vote Yes campaign. Obviously that’s a large difference…and shows people are largely swayed by those stupid commercials on television. I think a lot of things need to change about the money put in to political campaigns. And the truth’s about campaigning. It’s a start. Kudos to those who worked so hard.